Grass Valley's Edius has always been a capable and versatile NLE. Can version 6 bring it the popularity it deserves? Edius is an interesting programme in many ways. OK, so it's another video editing package and you might think there's nothing remarkable about that, but actually it's something of a dark horse. Many professional editors have scarcely even heard of it, still fewer actually used it. This is odd, since it's backed by the might of broadcast giants Grass Valley, and has been around for donkey's years. Edius was introduced in 2003 by Canopus, then something of an upstart company in the world of professional video. They hailed it as the Next Big Thing in editing, but the old cynics amongst us — noticing that Edius was Canopus's replacement for their previous Next Big Thing (Storm Edit) — smiled our cynical smile and assumed it would be gone before too long. In 2005, Canopus got swallowed up by Grass Valley, but Edius survived. Well, I've got news for the cynics. Edius is seven years old, and version 6 has just been released. With the patronage of Grass Valley, it's been steadily carving itself a niche as a reliable, solid and quick‑cutting NLE with excellent format support. This is the first major release for two years, the first iteration of v5 hailing back to 2008. In software development, that's a long time, so we should expect this to be a big update. There are no particularly fancy claims made on behalf of Edius – it's still a 32‑bit application and will run on your older Windows XP platform, but it will also happily run under Vista or Windows 7 64‑bit. Sadly, there's no support for Mac OS X. There's also none of the 3D Stereoscopic editing malarkey. No doubt its time will come, but Edius is aimed squarely at the here‑and‑now of broadcast editing, and I suspect Grass Valley don't see the need to include it at this stage. In some ways, this feels like an old‑school product. How many NLEs these days use a USB dongle licensing system? It's still an option for Avid Media Composer, but for what other packages? Just Edius. How many pieces of editing software are designed to work with specific capture hardware from the same vendor? Avid's range, yes — and Edius! So it seems as though Edius is pitched as a competitor for Media Composer, despite being a fraction of the price. The 'Check Out' dialogue allows the user to generate 'proxy' (smaller sized and easier to edit) video files for editing on a laptop, for example. Once you're done, check the project back in. When you open the software box, in addition to the Software discs and the USB dongle, a couple of stickers fall out onto the table. Presumably they're there for you to decorate your editing system with! They proclaim "Edius 6. Edit Anything”. Unravelling the marketing slogan reveals that Edius is a multi‑format editor par excellence, and has been for a long time. 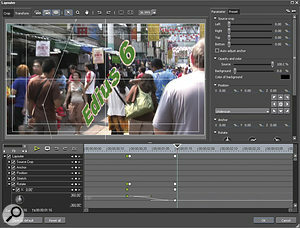 While Avid have been slowly but steadily opening up their system to native camera file formats in recent years (editing files without converting them to another format), and Premiere Pro has now joined the native-editing party with the arrival of the Mercury Playback Engine, Edius has been intercutting multiple formats in the same timeline almost from the outset, through simple and efficient codec application. It coped very well with the mixture of standard definition DV, 1080i/50 DVCPro HD and 720p/25 XDCAM EX that I fed to it. As you might expect, the opportunity has been taken in v6 to extend support further, to the latest crop of cameras and formats. Media from the latest Canon XF camcorder range is directly editable, and there is also support for 1080p/50 and 60 formats — if you can find something that can shoot at these frame rates! Although primarily aimed at the broadcast editing market, Edius 6 also supports both 2K and 4K formats, opening up the world of digital cinema work and encouraging its adoption at the high end of production. This is all in addition to Edius's well‑established multi‑format support. For example, AVCHD has been editable in Edius without transcoding for a while, if necessary reading the media straight from the SDHC card! Of course, playback performance may well stutter unless you've got lots of computer processing power available, but although frames may be dropped, the timeline maintains composure and makes the best job of playback that it can. By comparison, Avid Media Composer and Apple Final Cut Pro both still insist that AVCHD media is imported and converted to a more palatable codec — DNxHD or ProRes 422 respectively. This is inevitably going to cost the editor time (although FCP's Log and Transfer tool can at least do the transcoding in the background). For quick‑turnaround situations, Edius has the upper hand. It's not just that different formats and frame sizes can co‑exist in the same timeline; in my test edits, Edius also proved itself able to handle media of different frame rates without making a fuss. Clips at 1080i/50 (PAL) imported into an NTSC (29.97fps) DV project played on the timeline with their speed and duration maintained. This is achieved by creating the necessary new intermediate frames automatically, by blending adjacent existing ones. The result, while not the world's best conversion, was perfectly acceptable. Of course, Edius isn't alone in this capability. Avid Media Composer can perform similar tricks, and offers both the same frame blending and more sophisticated 'fluid motion' vector‑based interpolation, but it's good to see such capability at this lower price level. The Source Browser settings require you to tell Edius where to look for specific media formats. The processing demands of high‑resolution video files (and the fiendish codecs that are being devised to encode them) mean that unless you're working on some pretty exotic hardware with a fast, high‑bandwidth disk array, you may not be able to play media without dropping frames. The editing process can become bogged down and slow as a result. Edius 6's approach to this problem is to let you edit with Proxy files — lower resolution versions of the original media that take up less bandwidth and processing power on the system. Grass Valley claim that using Proxy files avoids problems associated with network bottlenecks for systems using media servers for storage, as well as helping slower computers to cope with demanding codecs and data rates. It can also help for editing on the move using a laptop, which may not have the power to edit full‑resolution files smoothly. 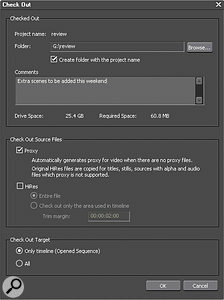 Edius 6 can create Proxy files during video capture, or it can create them as a background process from clips already captured or imported into the project. Sequences edited using Proxy media can be relinked to the original high‑resolution media when appropriate. Having read good things about Proxy working, it took me a while to figure out how to actually do it. Annoyingly, the Proxy Mode button isn't displayed in the interface by default; you have to map it onto the toolbar via the User Settings menu, but the procedure is pretty painless. The decision to use Proxy media can be made at any stage. Selecting Proxy Mode automatically links the Timeline to proxy‑resolution versions of the media, and Proxies are generated if they don't already exist. 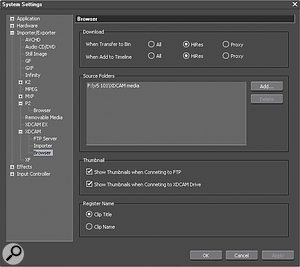 It's a little reminiscent of Avid Media Composer's Dynamic Relink feature, except that Dynamic Relink is only available in a large-scale Avid Interplay network environment, whereas Edius's Proxy mode works on any stand‑alone system. Moving projects from one system to another is also supported. 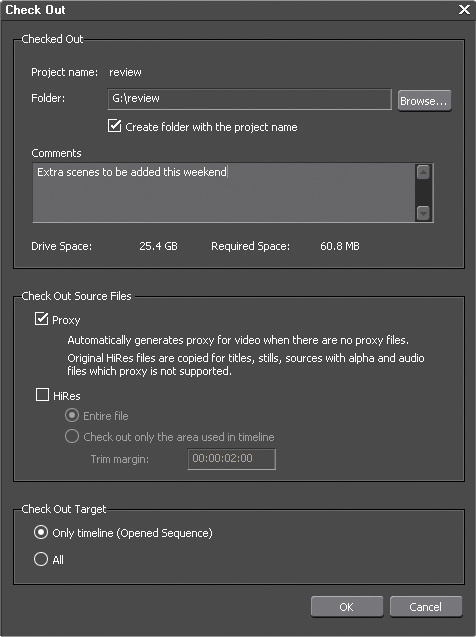 A typical workflow scenario might be that you've started editing at home, but would like to take the project away and continue work, perhaps on a laptop system. Edius allows you to 'Check Out' the project, effectively copying the Project information to a removable drive, together with Proxy versions of the media files involved. The Project on the original system is then flagged as having been 'checked out', so that if someone attempts to do further work on it, they are forced to save as a new version, therefore protecting the original. Once the project is brought back to the system, there is a reverse 'Check In' process to update the project with the changes made. If new media has been added, it is automatically copied back to the host system. It's not really rocket science, and it's tempting to think that the system doesn't do much that the user couldn't achieve by other means, but it provides a logical workflow that even inexperienced users will be able to use with confidence. The inexorable rise in the number and variety of file‑based camera formats has made every NLE manufacturer re‑think how they browse for and import media. Apple Final Cut has the 'Log and Transfer' tool, Avid Media Composer has AMA (Avid Media Access), and Adobe Premiere Pro has the Media Browser. Edius's solution is the Source Browser. Setup is a little clumsy, involving a trip to the System Settings, where file paths for media folders can be established for each of the various file‑based media formats. 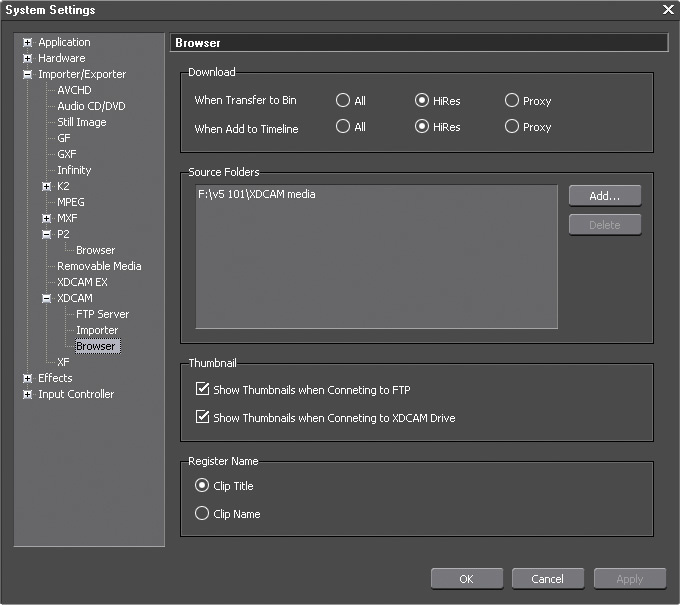 So, for example, you can establish an XDCAM media folder on a drive or a network share, and as XDCAM media arrives you copy it to that folder. The Source Browser itself is laid out nicely, and can copy media to project folders as a background process. Once Edius 'knows' of the correct folder, it'll automatically display the contents when you select the corresponding media type in the Source Browser. Though it takes a little setting up, it's a great way to make sure your media don't get lost! You'll see a thumbnail of the first frame, together with media information and timecode. 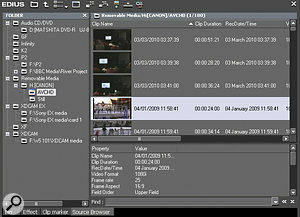 Double‑clicking the thumbnail loads the clip into the Source viewer for in- and out-point selection and editing, or the clip can even be dragged straight to the timeline if needed. However, you can also right‑click the clip in the Browser and choose 'Add to Bin' to create a Clip within your Project, or 'Add to Bin and Transfer' to both add the Clip to the Bin and copy the media to your Project's media folder. Luckily, copying media to the Project can be a background task, so you don't have to wait for the footage to arrive before you get going on the edit. The Timeline is reminiscent of many other NLEs, and a lot of the keyboard shortcuts are similar to those found in Media Composer. Editing in Edius 6 is much more 'mainstream' than in previous versions. The timeline now sports a track panel that uses very similar track-patching logic to Avid, FCP and Premiere Pro. Tracks can be individually locked to prevent editing, and the sync‑lock logic now follows the common practice. This seems like the right approach to me — if you're a small competitor in a mature software market, placing hurdles for new users to jump before they can start to use your product doesn't make sense. In practice, my knowledge of other editing packages let me get going straight away, without delving into the help files. The keyboard mapping is very similar to Media Composer's, further aiding familiarity. 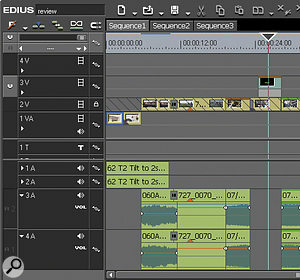 A new feature in Edius 6 is the addition of 'VA' tracks, onto which both video and audio from a clip can be edited. This is a nice addition, and is potentially quicker than using standard tracks if you're simply assembling pre-edited clips or thrashing out a News story, though I suspect that most editors won't use them much. Timeline displays are also improved, with cross‑hatching to indicate locked tracks or clips with missing media, and helpful wire‑frame displays during drag‑and‑drop editing. While existing Edius users will be pleased to see these new features, newcomers whoare used to other NLEs will take them for granted –— there's nothing here that other NLEs haven't had for years. 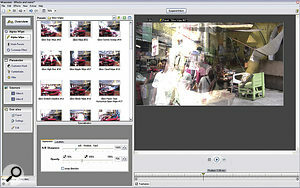 Also new is the ability to use a second computer monitor as a full‑frame preview device. Previously, full‑frame output required either a DV deck or bridge, or use of one of Grass Valley's hardware cards. Again, this merely brings Edius in line with the sort of functionality you'd expect in professional editing software. Live event editors will also be pleased, as Edius 6 can handle up to 16 cameras for multicam editing, and can display either the 16‑way multiscreen or the resulting output on the full‑screen monitor. 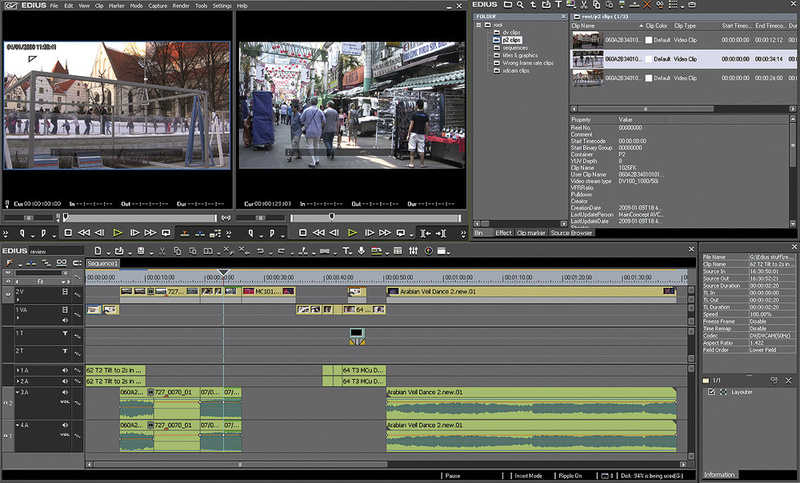 Little editing niggles include not being able to switch off audio scrubbing in the timeline, and conversely not being able to enable it when trimming, but generally editing is quick and easy. One aspect of the timeline that still marks Edius out is the use of separate tracks for titles and graphics compared with ordinary video tracks. This seems unnecessary, and indeed a quick check revealed that video plays fine on a title track and vice‑versa, begging the question 'why bother'? The positioning of title tracks underneath the video tracks — although they appear on top of video — also seems a little eccentric. 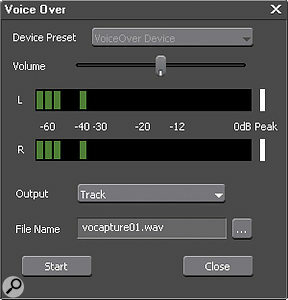 The new Voice Over tool allows recording of audio directly into the timeline. By comparison with the video side, audio has seen relatively little change. There's a new Voice Over tool, which allows you to record voice-over directly into the timeline while viewing the playback pictures. It's a useful feature for news editing, and one that Edius needed to compete with the rest of the pack. Otherwise, there's some improvement to the functionality of the Audio Mixer, which has tweaked real‑time audio-mixing capabilities, and to the Audio Channel Mapping dialogue, which now allows comprehensive control over the assignment of timeline tracks to audio outputs. This makes it possible to output a full stereo mix to outputs 1 and 2 and a simultaneous effect-free mix to outputs 3 and 4, for example. Edius 6's effects palette has received a shot in the arm in the shape of the ProDAD Vitascene plug‑in package. Vitascene offers a wide range of colour and style effects, and includes a large preset base with the option of customisation.Vitascene offers a wide range of 'filmic' picture treatments including highlight and lowlight diffusion, blurs, grain and noise, light-ray effects and so on. It's heavily preset‑based, but with full customisation also possible. 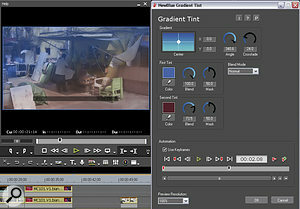 The filters can be used on video or title clips, and a range of transition effects are included offering many of the currently‑fashionable 'glow‑dissolve' styles. Noise reduction, sharpening and some other tweaks can be carried out using the bundled NewBlue FX Video Essentials.Also included is the NewBlue FX Video Essentials package. Again highly preset‑based, these plug‑ins offer some useful image-processing modes for removing noise, sharpening footage and making simple colour correction tweaks. Another major addition to the effects system is the Free Shape Mask effect. It allows the user to draw a bezier‑curved mask on the video, which can be keyframed (automated) to follow the motion of the object being masked. Combined with a blur effect, Edius can now do a good job of blurring out things like faces or number plates relatively quickly, although a tracking tool would be a welcome addition. The strangely named Layouter is capable of 3D title creation and motion, similar to that found in Adobe After Effects.The Layouter, Edius's rather inelegantly‑named version of FCP's Motion tab or Media Composer's PIP (Picture In Picture) effect, has also been improved. It's now capable of 3D manipulation — rotation around X,Y and Z axes — allowing images to be manipulated in perspective. Individual parameters are separately keyframable and the whole process has a good, quick feel to it. An apparent limitation of the effects system is that while adjusting an effect, it's only possible to monitor the results of that effect by itself. In other words, if you've applied several effects to adjust colour balance, add film‑style noise, and mask around an area, you can't monitor the result of all three as you tweak the constituent parts. Taken as a whole, many of the improvements and new features in the Edius effects system are things that were previously lacking, but overall I feel that great strides have been taken to bring Edius 6 into line with the functionality expected and required of a modern NLE. Edius has pretty comprehensive export capabilities, with its own built‑in media encoder offering pretty much everything from Tiff sequence to DVB‑T transport stream (which is much less common) as export options. 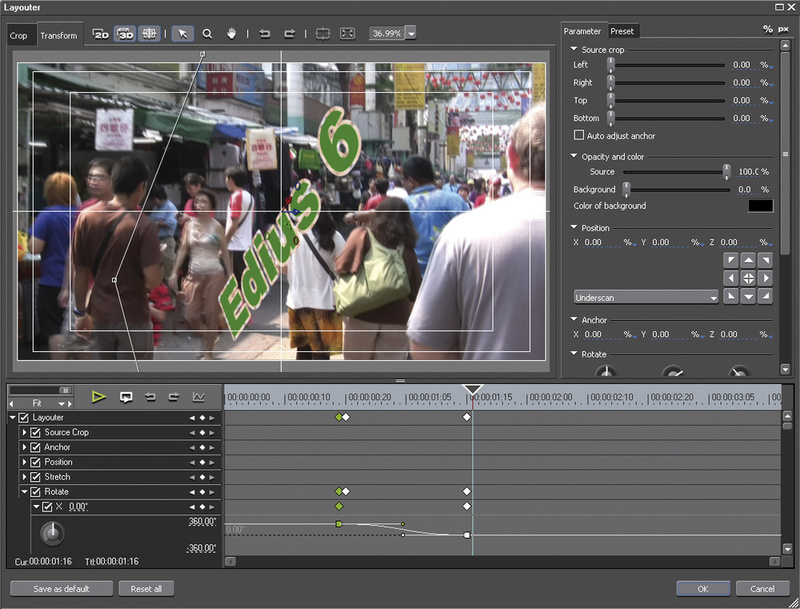 New features in Edius 6 include the ability to export AVCHD sequences either directly to SDHC card or to a folder (generating the necessary AVCHD folder structure to go with it) and improved Blu‑Ray disc‑authoring directly from the timeline. This allows the user to design moving menus using sequences from the project as background elements, and there's the usual range of templates to choose from as well. This release brings Edius software bang up to date, not only in its format and codec support, but also in terms of functionality. Crucially, those new features have been well designed and integrated into the package. Clearly, Grass Valley have thought carefully about what users needed, and have delivered. The result is a likeable, easy-to-use programme that won't intimidate the prosumer, but nonetheless has the solid professional feature set that the broadcast community demands. There are limitations, particularly on the effects side, but I suspect that many users won't care too much. The price is quite attractive, and at £675$725 it's less expensive than Adobe's Premiere Pro CS5, probably its closest natural rival. On the down side, Edius is a stand‑alone piece of software, and to string the sort of companion programmes around it that Adobe can offer in the Production Premium suite (although it's admittedy more expensive) is going to completely destroy that price advantage. Similarly, the Final Cut Studio package is more capable and complete, providing you want to pay the premium for the Mac to run it on. 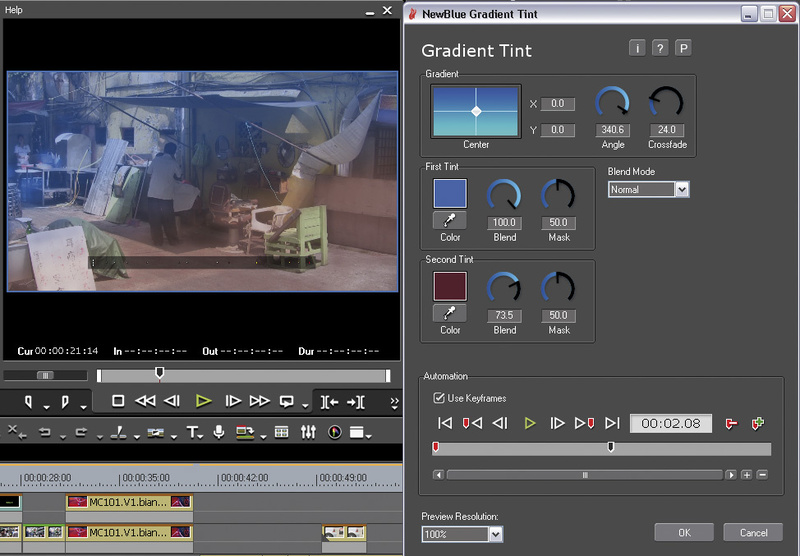 At various points, I've drawn comparisons with Avid's Media Composer. Edius stands up well here too. Although there are details missing, it's not outclassed by any means. Overall, whether Edius 6 is 'better' than the competition is not an easy one to call. Let's just say that this software deserves your consideration, regardless of the level at which you're working. Seek it out and give it a go — I'm sure you won't be disappointed. Sony Vegas Pro 10 is in a similar price range, and is worth a look, while Avid Media Composer 5 is a more expensive but comprehensive alternative. 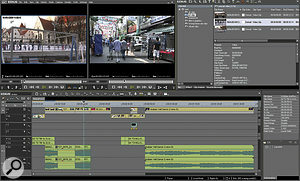 Adobe Premiere Pro CS5 can purchased stand‑alone or as part of the Production Premium suite, which also includes After Effects. Like its competitors in the NLE market, Edius will run either as a software-only NLE or in partnership with a variety of capture cards. 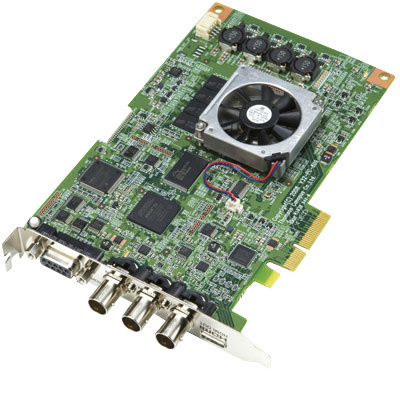 Grass Valley have recently introduced new capture hardware in the form of the Storm 3G and Storm 3G Elite, both of which offer 10‑bit video I/O. The Storm 3G Elite is designed as a stand‑alone breakout box, rather than as a PCIe card, and has the capability to be connected to a laptop system for mobile editing. By comparison with the previous HD Spark and HD Storm hardware, the two new models use faster 4xPCIe interconnects, with the additional bandwidth making 1080p/50 and 60 working possible. It's also possible to capture XDCAM and AVC‑Intra directly as baseband MXF (in other words, without transcoding to another codec), therefore maintaining precious source‑picture quality. While many video codecs use 8‑bit colour sampling, post production is best carried‑out at 10‑ or 12‑bit rates. Complementing the new 10‑bit hardware, Edius 6 has a new 10‑bit version of the Grass Valley HQ editing codec, appropriately called HQX. Ten‑bit working is also available if you choose to work either uncompressed or with AVC-Intra media. However, not much of the effects processing in Edius currently supports 10‑bit, and using 8‑bit 'legacy' effects will result in your video getting stripped of those extra two bits. The 10‑bit effects list is currently pretty small, consisting of the 'Layouter' (basic 2D picture‑in picture effects), 3D Picture In Picture, and alpha compositing (using transparency when blending layers), so 10‑bit support has to be considered a work in progress at this time. In the first major Edius release for over two years, Grass Valley have brought the software bang up to date. They've added support for the latest camera formats including Canon's XF range, introduced two new hardware capture devices, and revised the user interface with a wide range of innovations and improvements. There's room for a little refinement, but at this price, Edius 6 is a serious contendor. Windows XP, HP Z400 workstation, 2.4GHz quad‑core Xeon processor, 4GB RAM, NVidia Quadro 380 GPU.